We’d made several attempts at Lost Lake. Following the reports of fishermen, hunters, hikers, and Ken Wilcox, author of Hiking Whatcom County, we joyrode up and down the logging roads off South Pass Road looking for the mysteries of Sumas Mountain. 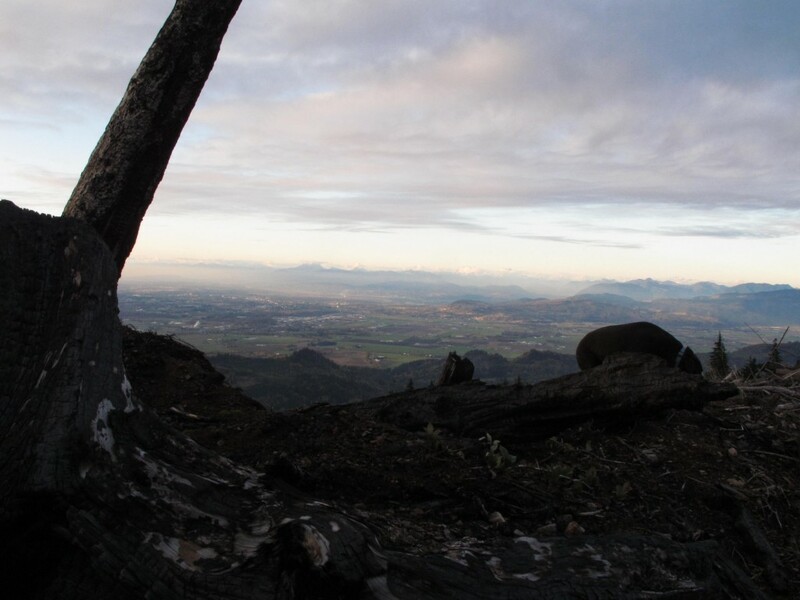 Rich in a natural and a people’s history of Whatcom County and a little microcosm of northwest history, Sumas Mountain is still an under-appreciated piece of hiking paradise and is much more massive than you might give it credit for when passing on the Mount Baker Highway. The 13-mile detour south at Nugent’s Corner and back north to Kendall is evidence of the extension of Sumas Mountain, which still only stands at 3430 feet. I wasn’t able to process the enormity of this round-about detour that the Mount Baker Highway needed to take around the mountain until I saw it from Primitive Point, one of the appropriately nicknamed spots we ended up at in our search for Lost Lake. With a stunning view of the High Divide, Church Mountain, the borderlands, Mount Baker, the Skyline Divide and Cougar Divide lurking to the south through the clear cuts and excavation equipment, we could hear the primitives testing their semi-automatics blowing up old television sets, washing machines and old non-operative cars left to rot on what once was a forest floor. A rainbow-colored ocean of shotgun shells lays along the logging roads, mingling with the dirt and rocks. The forests of Washington state are like graveyards of rotting machinery. It’s always strange when David and I, two pacifist academics, walk past pick-up trucks filled to the brim with enough artillery to blow up the side of the mountain. The drivers give us looks that say, “Why the heck are you walking? We’ve got some dirt bikes in the back of our trucks you could use.” Whatcom County is a strange confluence of lumberjacks and tree huggers, and stepping out onto Sumas Mountain, this strange mix of sociologies and histories comes to the forefront. Overlooking Primitive Point is a spot David baptized as Primate Point. Looking somewhat like the Forbidden Zone in the 1968 sci-fi film Planet of the Apes and its imaginings of a post-human earth taken over by apes, Primate Point is a look at what the earth will look like once humans have finished using it up. At once pretty and disturbing, a pleasant and thick forest blends into a gaping hole on the side of the mountain, where people had carelessly clear cut and blown up the earth in search of some metal, leaving a eerily colored stream of water we call Arsenic Creek. Weaving stories about skiing the Atlas Mountains in Morocco, biking across Switzerland, and climbing the Popocatépetl volcano in Mexico with the strange honey town on the way up the mountain, David tells me a story about seeing Planet of the Apes in 1969 Madrid. This is before the end of Franco’s dictatorship and Spain is in the yoke of a stiflingly backwards social scene, long before the movida of the late 70s-early 80s, following Franco’s death, when Spain had a wild cultural renaissance. In 1969 Madrid you would clap your hands to have the innkeeper let you in with a large skeleton key; the sight of flesh on a woman would have still been novel. Seeing Planet of the Apes in this environment must have blown the minds of the Spaniards who were not in the midst of the cultural revolution taking place in the rest of western world that the film captures so well. The Forbidden Zone, the zona prohibida, is where the apes have evidence that human beings once had a civilization, but it also serves as a reminder of what once was a paradise that man made a desert of, as we see the remnants of the Statue of Liberty at the end of the film. It took us at least 5 sallies up Sumas Mountain to find Lost Lake. Signs clearly indicating Lost Lake led to false promises. Ends of paths, logging roads leading to nowhere. On one sally, we scaled Sumas Mountain itself from the bottom at Sealund Road. On this 8-mile trek up the mountain, we followed a sign that clearly said Lost Lake, but got nowhere but to the top of the mountain, to a radio antennae, and a man who had driven to the top and laughed at our futile efforts to find Lost Lake. On another adventure, we came upon a cabin with a friendly enough exterior. The cabin, not unlike Jacob’s cabin from the television program Lost, a cabin that moves from one location to another and where strange appearances by unknown characters guide the characters to continue on their quests, had a map. This map, truly not to scale, made Lost Lake look like it was just around the corner from where we were. We came back the next week, followed another sign up the mountain and ended up at a dead end with no indication of Lost Lake being anywhere near us. My GPS showed the lake as less than a mile away but through impenetrable forest and over an unscalable cliff. Lost, but still undefeated, we had to make several more sallies up Sumas Mountain before we found the lake. The former trailhead signaled in several guide reports of the trail no longer existed, hidden under the rubble of a clear cut, we finally found where it led. A small trail, through old Sitka spruce, fir, cedar, and loads of mushrooms, led to a small lake. Fairly nondescript, but pretty enough. A brushy trail led around the lake’s shores to an empty arm chair on the other side, which we’ll call the Canadian side. From Abbotsford, BC, there is an access road and after an old settler they call it Chadsey Lake, which might be a better name because there is already another Lost Lake in Whatcom County. Mysteriously, one map to this Lost Lake aka Chadsey show it as being in Canada, although nowhere during our hike indicates an entrance into the Great White North. Other maps show the lake in the U.S. Regardless, there is a good view of a post-apocalyptic wasteland at the borderland, a mix of pleasant forest, target practice sight, and mining tail-off. 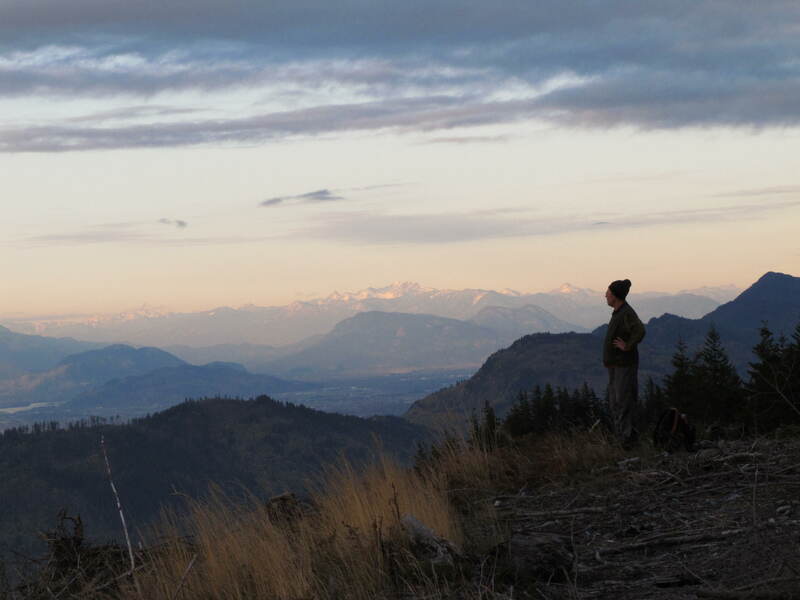 December 11, 2011 | Filed under Inspiration, Uncategorized and tagged with Abbotsford, hiking, hiking with dogs, Lost Lake, Sumas Mountain.